Our unique media platforms remains the most effective medium to send out your advertising message across the African continent. 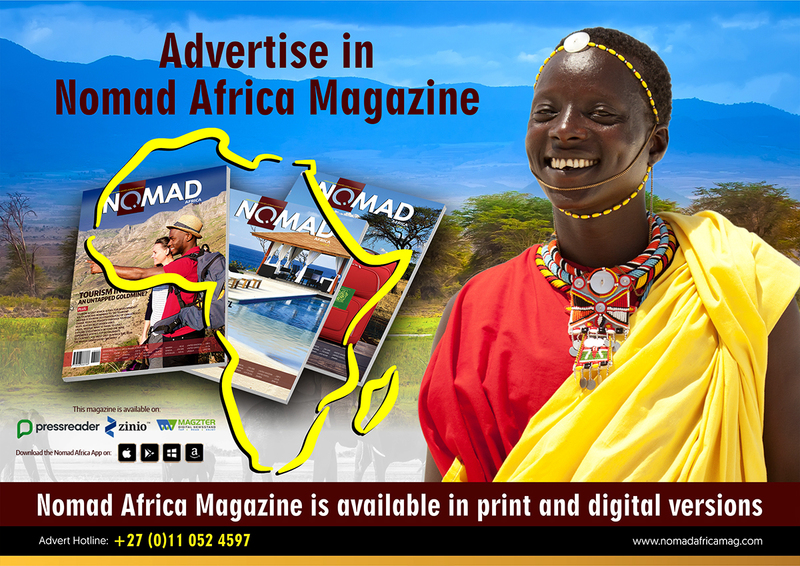 Nomad Africa magazine is a quarterly business tourism magazine and its available in both print and digital versions. The digital version of the magazine is available on digital newsstand platforms like PressReader, Zinio, Magzter and on Android, iPhone and Windows app stores. It distributes to a worldwide combined audience of over 300 million and an extensive network of sponsored hotspots which allows the magazine to be viewed and downloaded in more than 6,000 hotels worldwide and over 16,000 libraries, universities, cruise ships, airlines, government and corporate offices, hospitals, and cafes around the globe. What’s more? Nomad Africa magazine is available online on all digital platforms – on computers, e-readers, tablets and smart phones (blackberry, windows mobile, apple and android). Nomad Africa magazine has a global readership. Nomad Africa print magazine is available in most VIP lounges of international airports, business class sections of selected airlines, Four and Five Star Hotels, Spas and Casinos as well as luxury cruise liners which service the African coastline. Present distribution outlets across Africa are South Africa (Johannesburg, Cape Town, Durban & Port Elizabeth), Nigeria (Lagos), Ghana (Accra), Zimbabwe (Harare), Zambia (Lusaka), Namibia (Windhoek), Rwanda (Kigali) and Mauritius, Kenya, Seychelles to be added in the coming months. Distribution is continuously monitored by Media Support (PTY) Limited and On-The-Dot (Pty) Limited – the biggest multi-channel media logistics company in Africa. Nomad Africa print magazine retails in Woolworths, Checkers and CNA outlets nationwide. The magazine’s strong emphasis is to showcase business investment and opportunities, the aspirations, successes and concerns of Africans in the Diaspora, feature highlights of the continent’s cultural heritage, unique tourist attractions, business and industry, revolution in trends to millions of tourists and business investors visiting Africa each year. Advertisers can greatly benefit by using Nomad Africa as a powerful medium to deliver their messages to their identified market segments. The magazine offers valuable information and a reference resource on Africa and its inhabitants. It further offers advertisers a direct reach to decision makers, tourists, business persons and people of affluence across Africa and other countries. Contact our team to discuss advertising and partnership opportunities across all of our publishing platforms – the magazine (Print&Digital), Email Newsletters, NomadRadio, NomadTV, social media and on our websites.